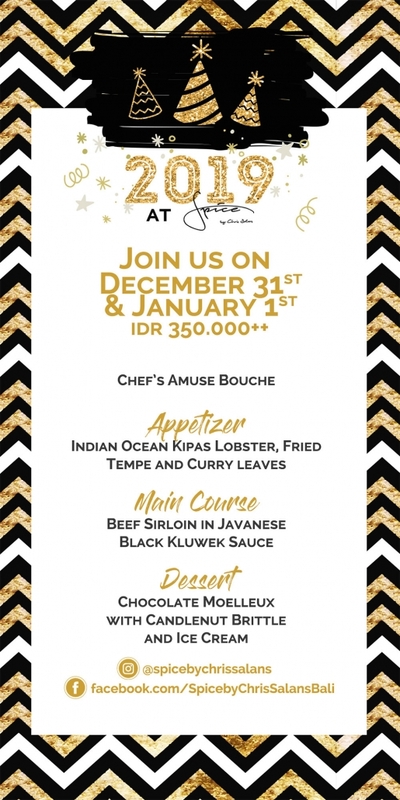 Spice by Chris Salans in Ubud will offer a special New Year’s menu all day on December 31st and January 1st. Chef Owner Chris Salans and his team of chefs will be using very special ingredients such as local lobster, steak and chocolate and, marrying them to seasonal Indonesian flavors in order to create a very special dining experience. The 3-course menu is Rp350,000++ for food only. There will be an optional special cocktail and wine pairing – two cocktails and one glass of wine to match the three courses of the menu. Bring family and friends to celebrate the New Year with great food and some friendly cheer!